1941 "Songs of the red Army" Vinyl Records. Just $18! Discussion in 'Classifieds' started by tweedydon, Jul 17, 2018. In honour of President Trump's "private meeting" with Vladimir Putin and *somewhat* in accord with my usual vintage offerings (!) 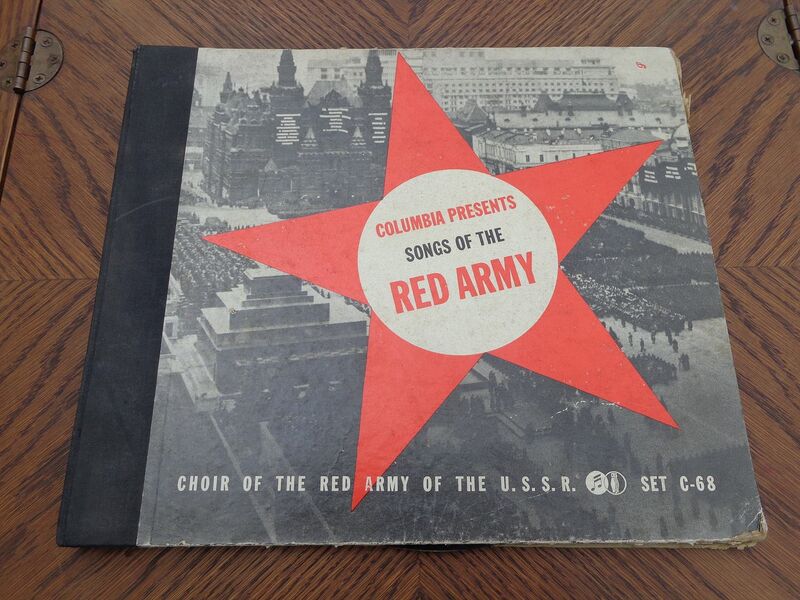 I'm offering the 1941 pressing of Columbia Record's "Songs of the Red Army", performed by the Choir of the Red Army of the USSR. Issued in 1941 just prior to America's entry into World War II, this set was clearly intended to bolster public support for an alliance with the Soviet Union. Although the two records included have no visible scratches or marks I'm afraid that I have no way of knowing if they play, although I assume that they do. And if they don't.... consider this to be even more authentically Soviet! The outer sleeve shows Red Square, and is in Good/Very Good condition. Asking just $18, or offer, shipped in the USA!